What can I say, I’ve always had a soft spot for the underdog and all things Halloween… whether actually Halloween or not. Clearly, by these very scientific criteria, bats were a shoe-in for childhood me. So imagine my excitement when my Pappo called me out to our mudroom one fall night. There, in his gloved hands… could it be? Oh yes, it’s what you think it’s going to be: a tiny bat, his furry little body no bigger than a date. Apparently he had appeared at the door and had his little wing shut in it before anyone even realized he was there. This was it, I thought to myself. This was the moment I’d been waiting my whole childhood for. I would keep him and I would call him squishy. And he would be mine and he would be my squishy. I would leash train him and together we would terrorize the neighborhood… I would teach him to fly to me on command… I would build a roost for him over my bed because, obviously… All our amazing hi-jinx and adventures flashed before my tiny, child eyes. Right up until my Pappo told me we would be calling the wildlife folks if he didn’t heal enough to be released in a day or two. What, you’re not letting your daughter keep a wild bat that has the potential to carry rabies? Geez, thanks parents. First you tell me I can’t legally change my name to Crystal Sparkle Rainbow, now you’re telling me I can’t keep a sky puppy? Geeeeeeeeeeeeeeeeeeeeeeeeeeeeeez. So if you’ve ever wanted a sky puppy, night kitty, flying devil rat or whatever you like to call bats, this one’s for you! 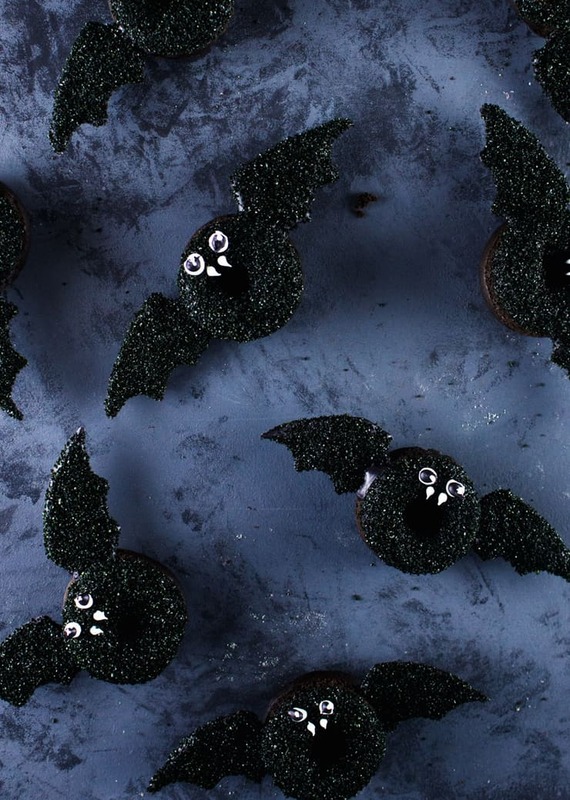 Adorable Halloween bat goodness all rolled up into a rich, chocolaty doughnut. DOES IT GET ANY BETTER THAN THAT?! And just because I love your faces, I’ve created chocolate wing templates are in mini doughnut template and regular doughnut template sizes. 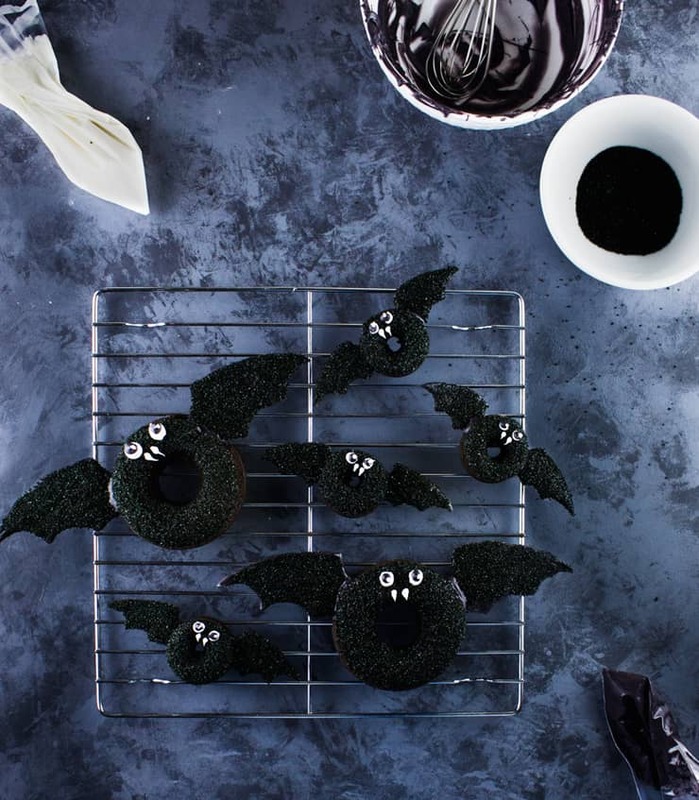 These Halloween bat doughnuts are every bit as easy as they are sweet. Perfect for a party or All Hallow’s Eve breakfast. Preheat your oven to 350*F (175*C) and grease your doughnut pans (This recipe makes approximately 12 mini and 8 large doughnuts). In a bowl, whisk together your dry ingredients (baking powder, baking soda, granulated sugar, baking cocoa, and flour). In a large bowl, whisk together your wet ingredients (melted butter, egg, and milk) until just combined. Add the dry ingredients and continue whisking until the batter is completely lump free. 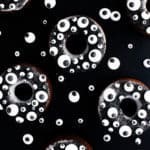 Spoon or pipe your batter into your greased doughnut pans and bake for 9-10 minutes, or until a toothpick inserted into the doughnuts comes out clean. Once the pan is cool enough to handle (about 5 minutes after coming out of the oven), turn the doughnuts out onto a wire cooling rack to continue cooling. Melt your black candy melts and spoon them into a piping bag. Cover your wing templates with parchment paper and pipe out enough wings for each doughnut to have two. Immediately sprinkle with black sanding sugar. Pour the remaining melted candy melts into a small bowl. Reheat using 5-10 second increments in the microwave if your candy melts are starting to harden. Dip your cooled doughnuts into the candy melts and sprinkle with black sanding sugar. Set aside to harden. Once your doughnuts and winders have hardened, cut two slits into the sides of your doughnuts, just big enough for the wings. Reheat your leftover black candy melts until smooth. Dip the end of each wing into the melted candy melts and push the wings into the slits you’ve created. Melt your white candy melts. Pour the candy melts into a piping bag and pipe your eyes and fangs. 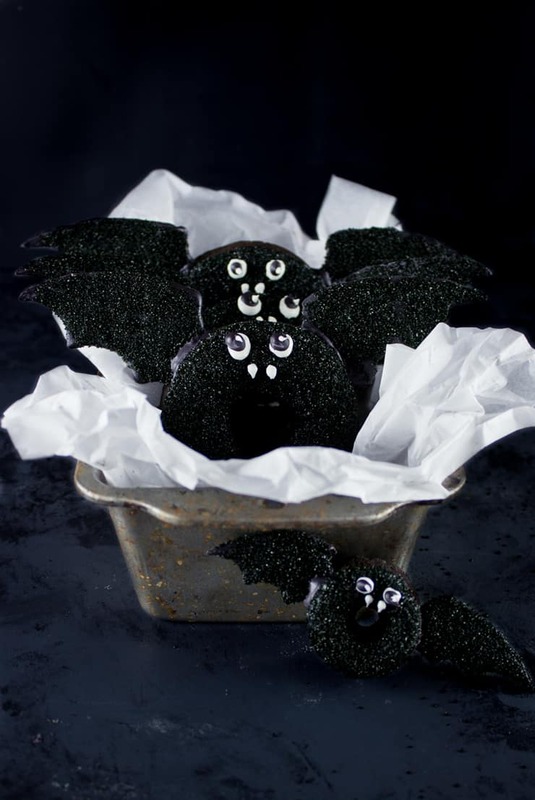 Pour your leftover black candy melts into a piping bag and pipe on top of the white eyes to create pupils. Add another dot of white candy melt on top of the black. Let harden completely before packaging. OMG these are SOOOO cute. I don’t know who would like them more. My GROWN kids, or my GRANDKIDS!! These are adorable. Pinning this for later! I much prefer bats than ghosts and witches. Oh my goodness, these guys are too cute! 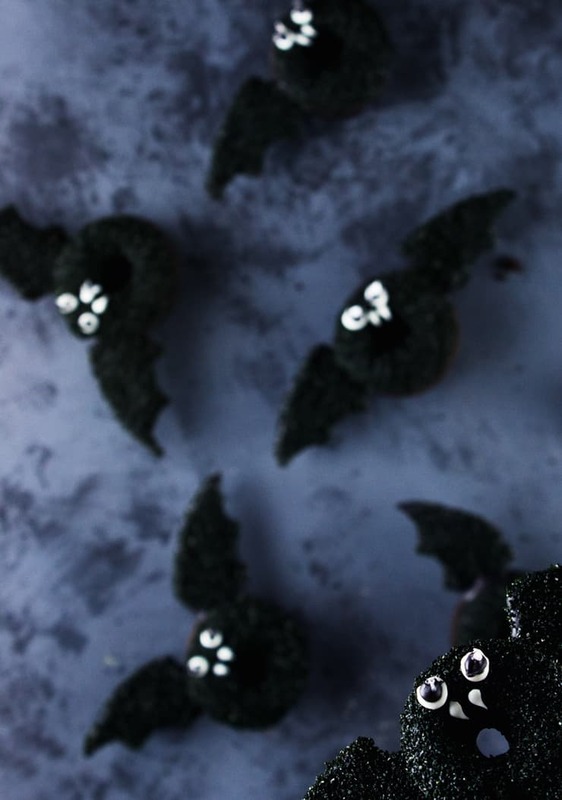 You have such creative Halloween ideas, and these little bats are no exception. Keep up the great work! 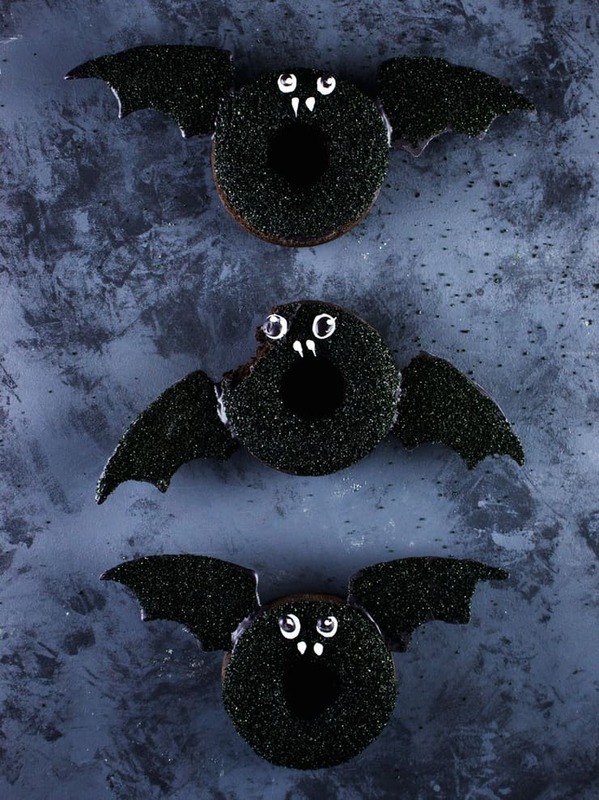 These bat doughnuts are so cute! 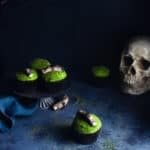 They look decadent and delicious! I am not fascinated with bats. I don’t mind them, we just got tired of them entering our home. Not fun seeing a bat flying around your living room. 😉 I can’t wait to make these donuts. this is adorable but creepy at the same time – i dont know if that make sense!!! 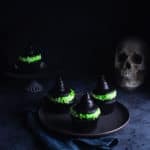 These are easily the cutest Halloween treat I’ve seen all year. I love the sparkly black tops! Plus, you really can’t go wrong with doughnuts! These are adorable! The sanding sugar is the perfect finishing touch, and I think the fangs are so cute! I’ve never been fascinated with bats because we had them in our attic when I was a kid so I was afraid of bats. These are seriously cute, though and they look fairly easy to make. 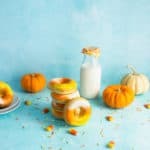 Perfect for Halloween morning! Your stories are so funny! 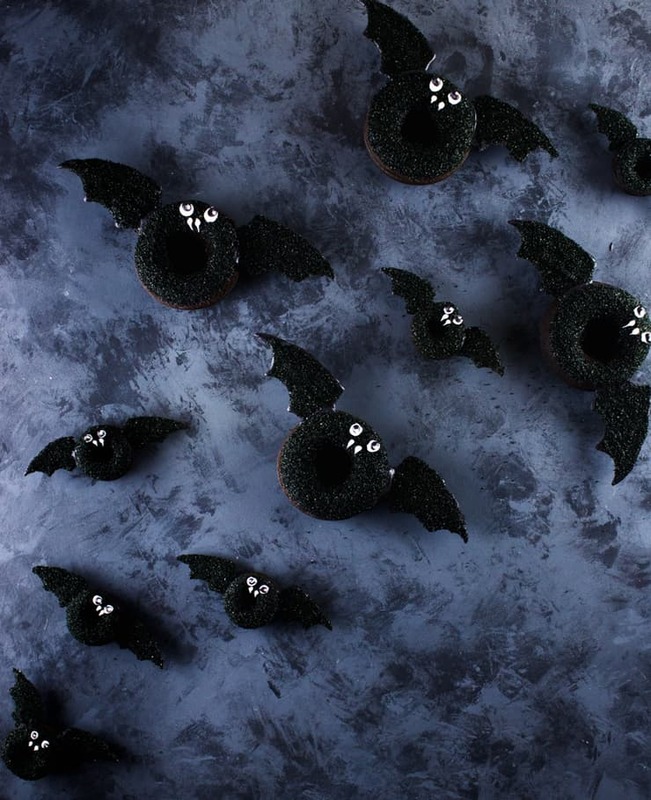 Hell no, I never wanted to have a pet bat, unless it looks like your donuts! Oh my goodness, cutest recipe idea EVER! These seriously look flawless. So perfect for Halloween! What a great idea. Perfect for kids on Halloween! I will be making these for the cake walk at our school. Oh my goodness I chuckled at this post! How funny that you wanted a pet bat! And then…you kinda got one!! hwo funny! Anyway – these are so super cute!! Perfect for the upcoming Halloween! 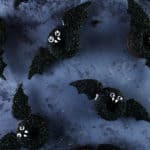 This is the cutest Halloween post I came a cross, the close up bat pic is so funny!!!! LOVE IT!! !